"Your vice is your undoing, and I'm here for you." Those are the closing words to what has become one of my favorite songs ever, "I Broke Wahoo's Leg" by Sweet GA Brown. For the last two years I've been somewhat obsessing over it. In fact, I first wrote about it almost exactly two years ago here on the Gateway in an article titled "Breaking Wahoo's Leg (and Other Transgressions)." In the song (off of Brown's album "Wordsmith"), the devil singing in first-person voice takes credit with great satisfaction for all sorts of sad and tragic events, name-checking the likes of Hank Williams, John Denver, Curt Cobain, Mike Tyson, and Jimi Hendrix, just to name a few. 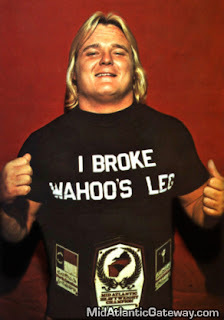 The moment in time in 1977 from which the song gets its name, however, is the infamous television wrestling match where Greg "The Hammer" Valentine breaks the leg of hated rival Chief Wahoo McDaniel. Perhaps his most devious deed of all. "If I could do you in, I'd do it right now and it would make me smile..."
It's dark and twisted and at the same time funny and clever and serves as a reminder that ol' Satan is always waiting around the corner for us to give in to our vices that always lead to trouble. 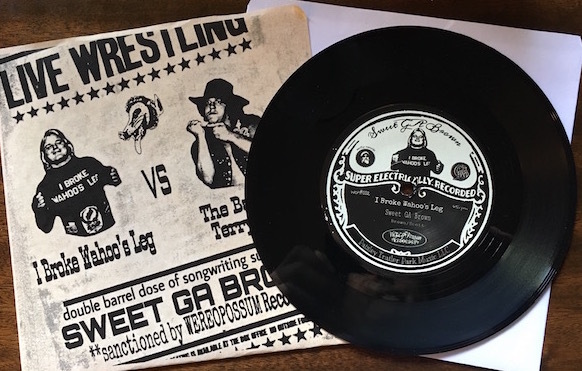 Late last year, Sweet GA Brown released a cool little 45rpm 7" vinyl single of the song, with a wrestling-related b-side as well, "The Ballad of Terry Gordy." The vinyl has great looking labels featuring images of both Valentine and Gordy, as well as sleeve-wrap that is designed to evoke the image of an old school wrestling event poster. Those aren't Brown's only tunes with a wrestling connection, by the way - - "American Dream" samples some classic Dusty Rhodes promos. There are likely a few more I just haven't come across yet. The vinyl version of the song (as opposed to the digital version which is available for download here) features a funny opening prelude with the voice of Greg "The Hammer" Valentine cornering GA Brown wanting residuals. The vinyl version also features a Honky Tonk Man coda, the voice of Wayne Ferris busting Sweet GA Brown right in the chops, too. 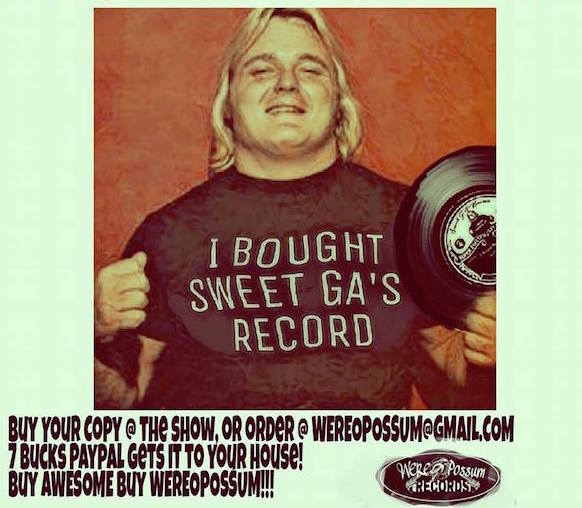 I believe there are still some of these 7" vinyl records left from WEREOPOSSUM Records, at least there were back in April when they posted a graphic on Facebook with ordering info. You can contact them and inquire by email at wereopossum@gmail.com. That graphic is posted below. It's such a a cool collectible, a keepsake channeling an iconic moment in Mid-Atlantic Wrestling history, and worth having for the cool packaging and labels (on vinyl, no less) whether you wind up digging the song or not. In the meantime, you can check out some of Sweet GA Brown's music on his Bandcamp website and support the artist by downloading a track or two. Listen to "I Broke Wahoo's Leg" and also download for a mere $1.00 here.